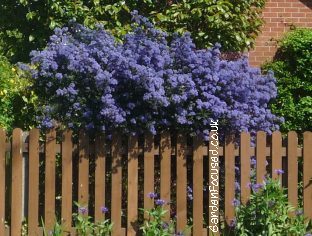 Is Ceanothus Right for my Garden? There is a large number of Ceanothus varieties but this article sticks to the ones popular and common in the UK. These varieties are evergreen and produce mainly blue flowers in late spring to early summer. To be brutally honest you wouldn't give this shrub a second glance when it's not in flower. The foliage is green but that's about it. However, when in full flower they can be truly stunning, the picture below (click it to enlarge and see more clearly) is not unusual, many Ceanothus look like this when in flower. They flower initially for about six weeks sometime between late spring and early May. Ceanothus are partially frost hardy. They do best planted in a protected position out of strong winds. Do not plant in areas which are wetter than normal. They grow on most soils but a neutral one is best. The commonly available varieties are evergreen. The foliage is relatively uninteresting. Normally Ceanothus are good for about five years, after that time they tend to deteriorate. They require minimal pruning, if any at all. Heavy snow can damage the branches significantly. This article relates to commonly available Ceanothus including "Puget Blue", "Cascade", "Concha", "Burkwoodii", "Autumnal Blue", Ceanothus thyrsiflorus "Skylark". It does not cover deciduous (loose their leaves in winter) varieties. Ceanothus need care when first planted. Choose a position out of strong winds where the soil is not too wet. They prefer a full sun position. If you can plant near a fence or wall which will provide a little support then all the better. Dig the soil well, allow it to settle for a few weeks then plant your Ceanothus to the same depth as it was in the pot. Sprinkle a handful of blood, fish and bone fertiliser on the surrounding soil. Expect it to spread roughly 3m (10ft) and to the same height at maturity. During the first year of its life water in dry conditions. After that only water if conditions become exceptionally dry for a few weeks. Most areas of the UK receive more than sufficient rainfall for an established Ceanothus. When grown in open ground Ceanothus should only be watered in very dry periods. Water well if needed but not often. A couple of handfuls of blood, fish and bone fertiliser in early spring each year is recommended but not essential at all if the soil is in good condition. Minimal pruning, in many cases none at all, is the key rule with evergreen Ceanothus. In general they do not respond well to pruning of main branches. If they look like they will outgrow their allotted space then the solution is to prune back thin stems by about a third soon after they have flowered. Late spring / early summer flowering Ceanothus do not do well in pots or containers. Consider some other shrub if pots are your only option. One we can fully recommend is Mock Orange which produces masses of flowers in early to late summer. 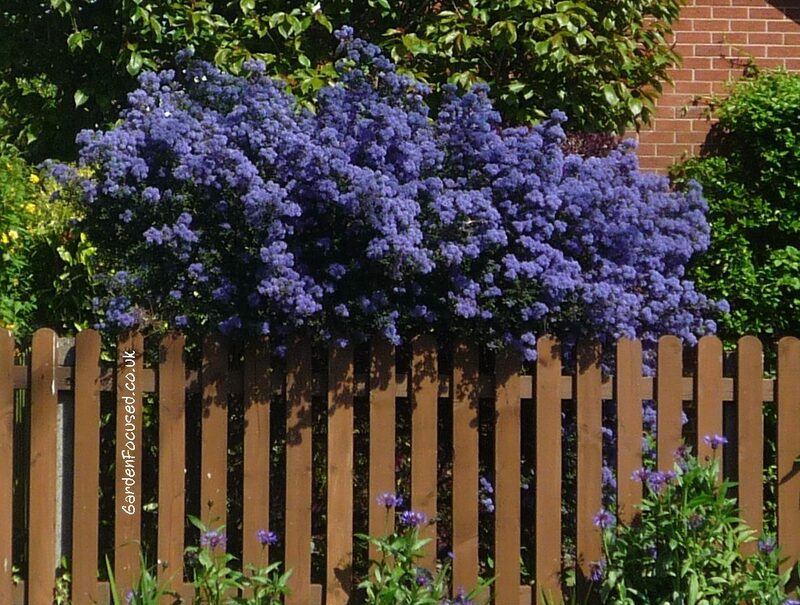 Ceanothus rarely suffer from pests and diseases. They do suffer if the conditions they grow in are not to their liking. If the conditions are too windy / cold they can get leaf scorch. If the ground is too wet they simply die slowly. One common complaint is that the branches break and / or split. This is a feature of Ceanothus rather than a pest or disease. As stated earlier they are relatively short lived shrubs so don't expect them to live much longer than five to seven years, occasionally some do but the majority don't. We list below some of readily available varieties of evergreen Ceanothus. The National Collection of Ceanothus is held at Stevens Park, Wollescote DY9 7JG. The most sought after of all Ceanothus because of the huge number of flowers produced. Our favourite . Frost Hardy? Hardy in most areas of the UK but needs a position protected from strong winds. Awards RHS Award of Garden Merit. Where to buy? We recommend Crocus as your online supplier of Ceanothus Puget Blue. Flowers? Masses of blue flowers cover the entire bush in May to early June with a slight almond scent. Frost Hardy? Hardy in most of the UK. Below we list the key strengths and weaknesses of Ceanothus.